Below is the YouTube link to the flatscreen version of Cosmic Castaways. The fulldome version is slightly different, in order to take advantage of the larger real estate of a planetarium dome. Rendered video in warped media format, suitable for spherical mirror projection system. Courtesy of Jim Havens from the Havens Foundation, Inc.
Below are all the files you may need to produce Cosmic Castaways for your own planetarium. Complete dome masters for 1920×1080 (Warped Media) or 1024×1024/2048×2048 are available upon request. New! Lesson plans appropriate for high school and Astro 101 students are available in the Educator’s Zone. 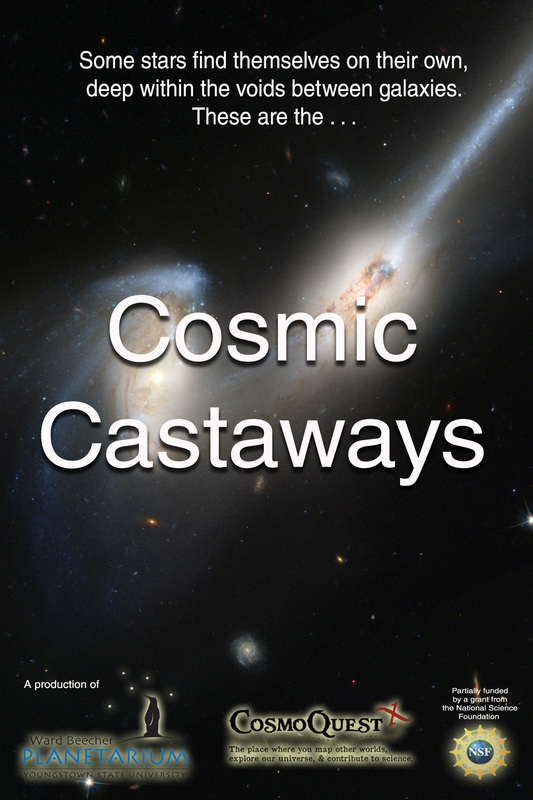 We were on Cosmoquest’s HangoutAThon talking about Cosmic Castaways on June 15, 2013.